My first airboat. 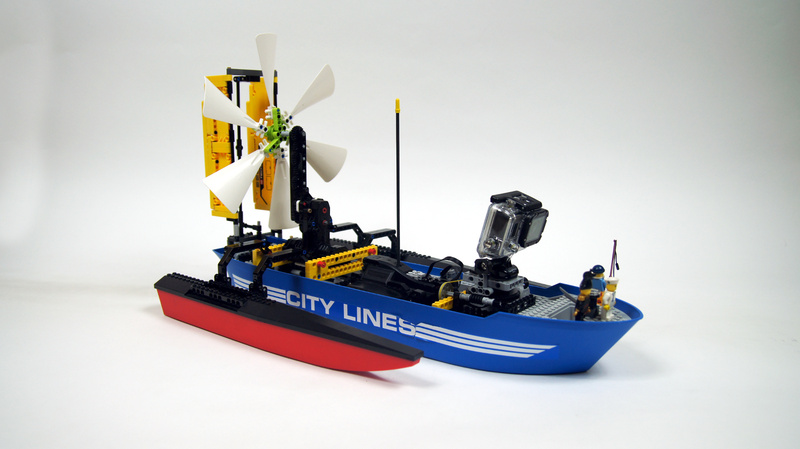 Features a double rudder and a rotating camera stand. 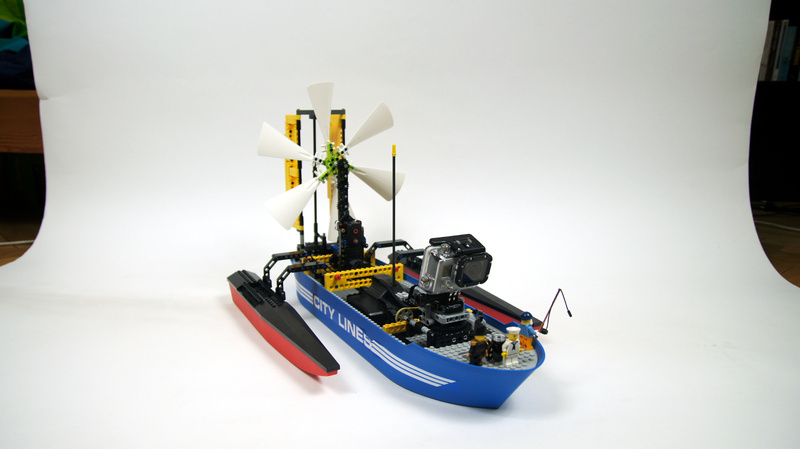 With a couple of attempts at building a fast LEGO boat behind me, I decided to turn to a more unusual design: an airboat. Airboats are typically small, flat-bottomed vessels that have no submerged parts other than hulls. They are propelled by aircraft propellers and engines, and a sort of a double rudder is used for steering, acting like vector flaps and directing propeller’s thrust. They have become popular thanks to their simplicity and a number of other advantages, including the fact that with very few submerged elements, they have much lower drag than conventional boats. 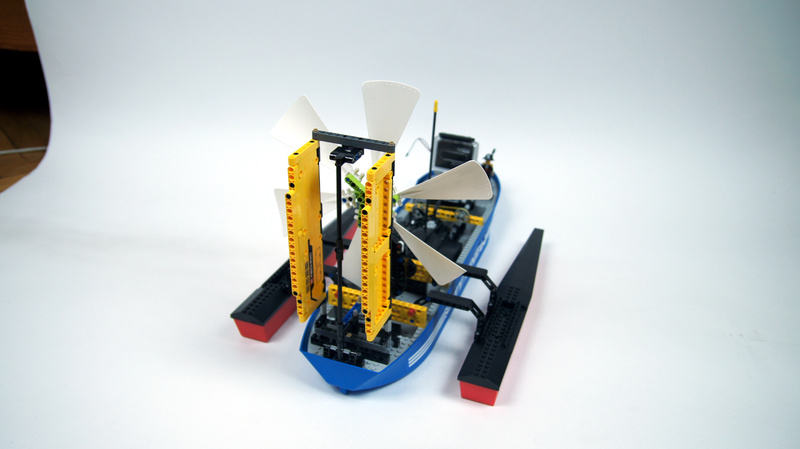 That last property made me think of an airboat as a possible high-speed LEGO vessel. 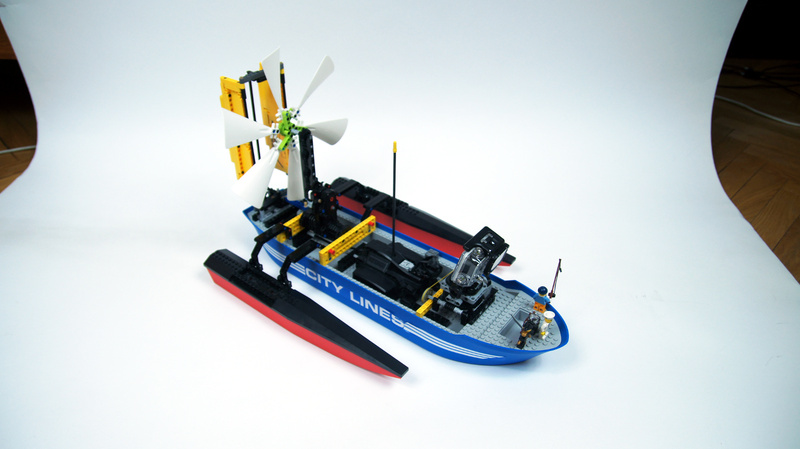 I have adopted a “maximum power” approach, selecting largest LEGO hull and propeller available. The propeller was quite massive and tall, so I have added two side hulls for sideways stability – they have proved very effective. 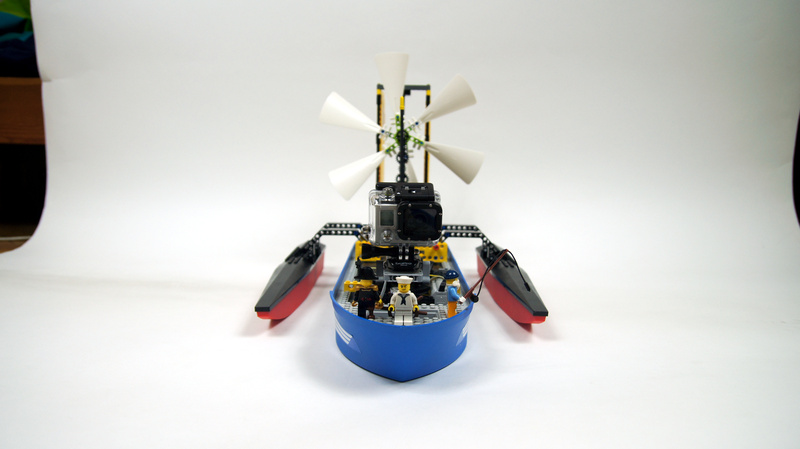 The propulsion was 2 RC motors powered from the RC unit. To allow testing various gear ratios, the propeller was mounted on a simple mast that could be connected to either RC motors’ output, and inverted as well, thus creating 4 possible combinations. 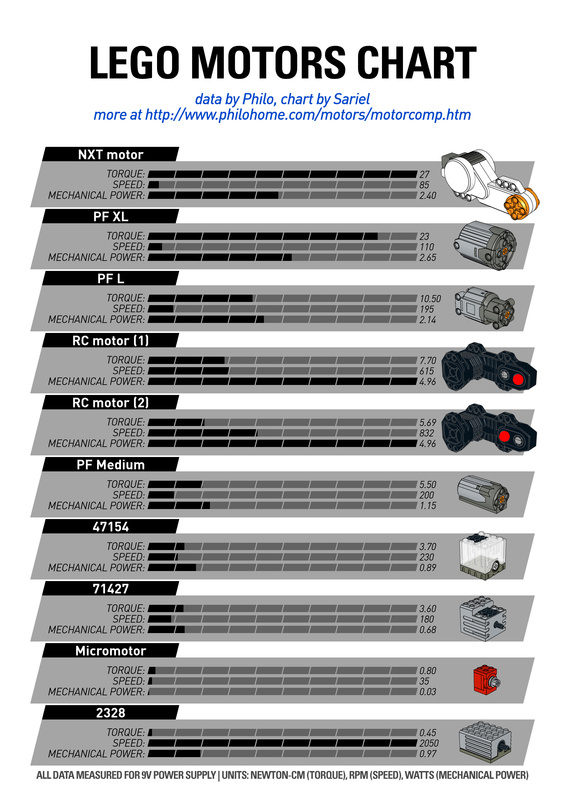 In my test, the most effective combination was: faster motors’ output slightly geared down (1.66:1). Steering was intended to be as realistic as possible, which is why I installed double rudder behind the propeller, connected to the RC unit’s steering output. Just like in the real airboats, it effectively provided vector control, directing the thrust. The final feature was rotating mount for the GoPro camera, controlled by a PF Medium motor connected to the RC unit’s auxiliary output. 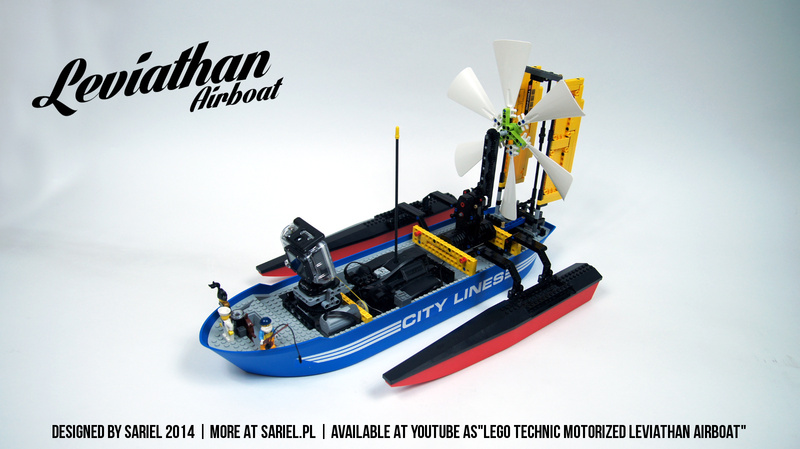 The finished boat, which I called Leviathan for its size, could be dismantled/folded for easy transportation. Despite its relatively large weight, it had a shallow draft thanks to the very high displacement of the central hull, while the side hulls added very little drag and improved the stability greatly. The outdoor tests became complicated because of a strong wind. It because obvious that a boat with a tall structure on it, and no submerged parts other than the hulls is very sensitive to wind. I had plenty of difficulties controlling the boat – it would not turn in certain directions at all, and sometimes it needed full speed just to counter the wind. At one point I was pretty sure I have lost the boat because wind pushed it out onto the lake. Because of this, the tests were kept short and I had no opportunity to measure top speed (which would be biased by wind, anyway) or even to use the rotating camera mount. This boat was a valuable experience. I’m sure that an airboat with less surfaces above water – that is, smaller thin-bladed propellers and no rudders – would prove much more wind-resistant. It remains to be seen how much of improvement can there be. Hi Sariel! I love your creations! 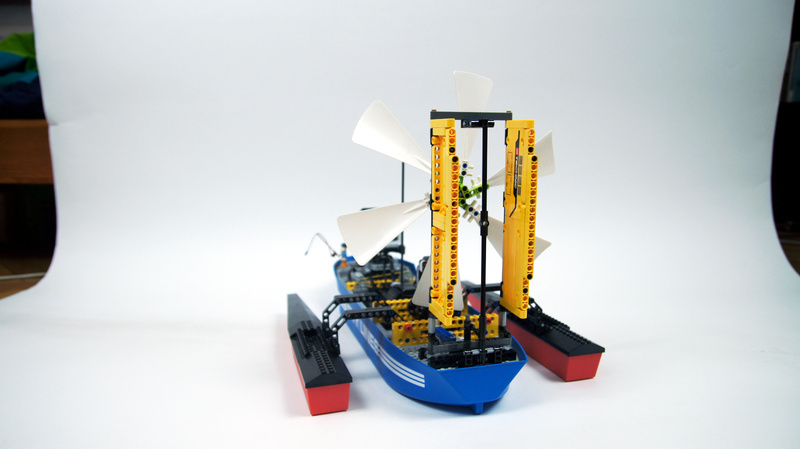 🙂 do you happen to know about bricklink? 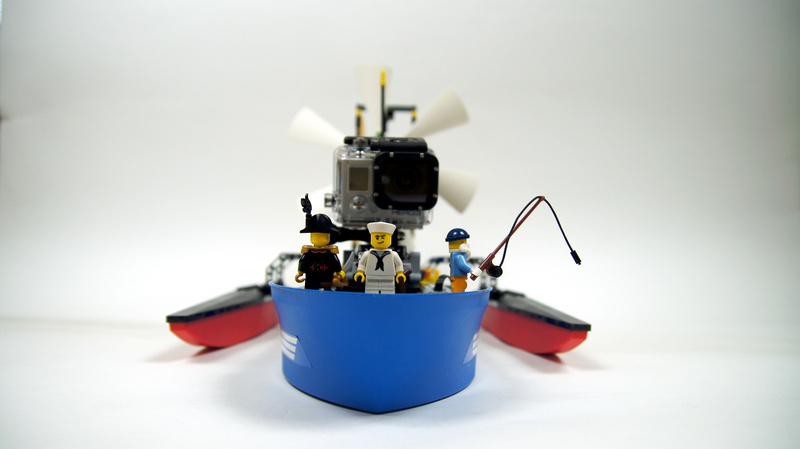 An online store for lego bricks.. what do you think about bricklink? I just want to have your opinion because i’m planning to buy the pieces that i need from them.. thanks in advance. Probably right, but it would still make a good experiment! I’m not sure actually. But seeing as the real airboats use flaps, not rudders, I guess flaps work better. Cool! I made one with average household material and it worked, but not so good 😉 Yours shows that lego works much much better! well done! could it be made to work with the rudders in the water? would it work better, not catching the wind? I have exactly opposite opinion. For the double rudder, couldn’t you use panels without stickers instead? It will make it look better. Considering how expensive the propellors are, would it just be better value to buy the whole add-on set that contains it? I think not, as they are very, very expensive. Are the propeller worth to buy them for using them as a kind of rotor? Yes. There’s a link in description. 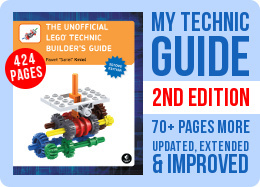 Are the propellers from a lego education set?